Scholastic chess has brought joy to thousands of young minds around the world. In particular, scholastic has instilled many characteristics needed in one's adult life such as, foresight, patience, sacrifice, time management, and the ability to make important decisions at critical moments. One only has to look at successful chess programs like Philadelphia's Vaux junior high school and their string of six consecutive National Championships in the 70s and 80s to realize how chess is really a blessing among Black youth. It has the amazing ability to transform behavioral patterns, but also provides an outlet for artistic expression. Players like NM "Woody" McClelland and NM Elvin Wilson enjoyed great success in scholastic chess. However, the youngest Black player to make National Master in the U.S. was Vaux's NM Howard Daniels who earned the title at only 15 years, 4 months! Other standouts were NM K.K. Karanja who made National Master at 15 years, 7 months and Ms. Baraka Shabazz, who made Candidate Master at 15! Pictured above is a picture taken from The Chicago Defender (April 14, 1981). 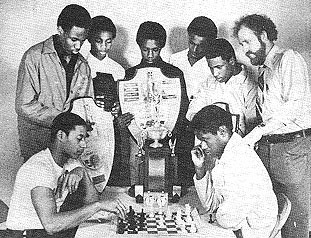 The photo accompanied a story titled, "Checkmate with Soul" about the chess team at Carver High School, a public school powerhouse of the late-70s to mid-80s. Melvin Alsberry (seated left) was 1st board and a scholastic standout. Eugene Walker (seated right) was 2nd board and one of the state's top sophomores at the time. What is it that encouraged these young talents reach a level of excellence in a game with a poor reputation? Scholastic activity perhaps began to grow in the 70s during the "Fischer Boom" and has become somewhat of a national obsession within the U.S. Schools are scrambling to incorporate chess in their curricula which could pave the way for college scholarships which some universities now offer. Perhaps the intrigue with chess comes from the incessant desire to "solve" the problems stemming from the many possibilities, the build-up and … the excitement!! The image problem with chess maybe the fact that most sports involve scoring and constant movement. Chess commentator GM Maurice Ashley has done much to show that chess can be described in a way that brings excitement and attracts attention. Known sometimes as the "John Madden" of chess commentary, his motivational approach has also produced championship results at Mott Elementary. It is obvious that all is needed is support and encouragement and the youth will take to chess with much enthusiasm. The parents of school-age children are often fascinated by the effect chess on their sometimes rambunctious children. In the U.S., chess has become a national obsession among school-age children. In addition, studies have shown that chess can assist a child in cognitive and spatial abilities. More studies have been done concerning the use of chess as an educational tool for everyone from college students to those students who have disabilities. Chess has an international appeal that seems to have captured the imagination of young players and has produced international stars such as IM Amon Simutowe of Zambia, IM Manuel Mateus of Angola, IM Pedro Aderito of Angola, FM Kenny Solomon of South Africa, NM Warren Elliott of Jamaica, and NM Ignatious Njobvu of Botswana. Previously, there was a problem with the lack of role models in the international community for Black players. Many Black Masters have taken active part in passing on a legacy as evidenced by IM Watu Kobese's efforts in South Africa and the full-time teaching activities of players like FM Stephen Muhammad and NM Ernest Colding. Jamaica launched a "KIDS-N-CHESS" program to spur the development of chess training in the schools. To see children at U.S. tournaments playing "bughouse" or "blitz" chess is a refreshing sight because there seems to be much enjoyment associated with this activity. This certainly smacks at the distorted images portrayed by the media as a boring activity for old retirees or introverted geniuses. Chess is certainly a clean activity and it can strengthens the mind like exercise strengthens the muscles. I remember my scholastic days as a player at an all-Black public high school in Chicago. The competition was fierce at "CVS" and you learned that you had to improve, or languish at the bottom of the club's rating list. With 100 players at my school's club, you had to fight through a maze of determined players who were trying to make the top five positions! Grudge matches were carried into the lunchrooms and trash-talking was rampant. You could be challenged at anytime and anywhere to play "for points." Between my junior and senior years, I studied six hours a day during the summer and went from 6th position to 1st! Although my parents sometimes worried, this single-minded focus later helped me focus on my Ph.D. research for long, long hours. I attribute much of my academic success to my earlier chess activities … it's been an important aspect of my intellectual development. There have been further breakthroughs with respect to scholastic chess. If you know of other outstanding young talents who's national rating is equal to "100" multiplied by their age, then let me know. Bennett Joseph of Chicago is ranked in the top 100 players in the 13-14 age group. Thomas Salome-EL has reinvigorated the Vaux program and perhaps they will relive the magic of the earlier era. Jannelle Richardson of New York has also been identified as a player with exceptional talent. There is currently a young star out of Philadelphia who you should take notice of. 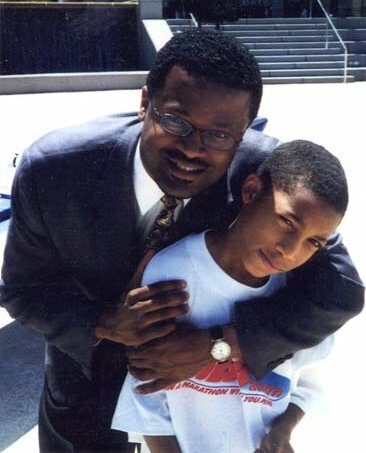 Pictured right is GM Maurice Ashley with rising star out of Philadelphia, 11-year old, Akeem Gregory-Thompson. Read about this talented young man by clicking here now! !